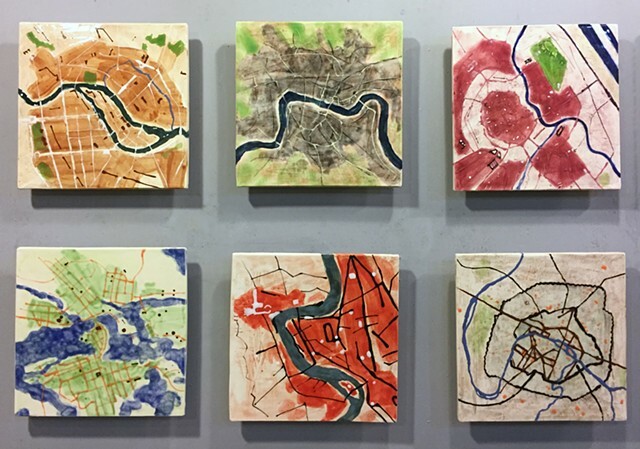 "Artists' Atlas: Mapping Their Journey"
Nine Chicago artists chart location, identity and memory through a multitude of various mediums and aesthetic styles. Monday - Thursday from 10am to 6pm. Reception is Thursday October 11 from 5 - 7 pm. 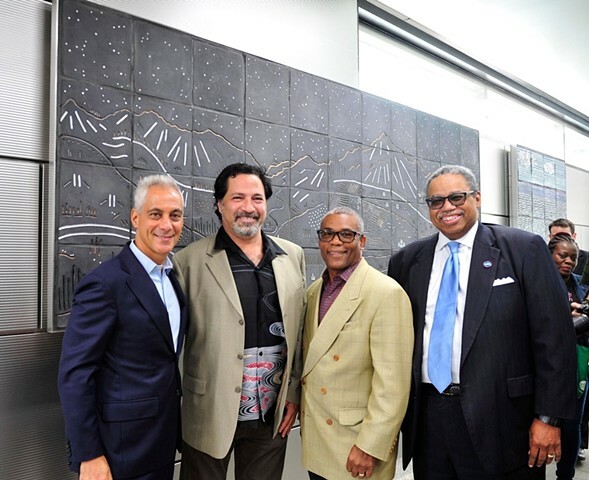 Jason Messinger's large public commission of five hand-made porcelain tile murals for the Chicago Transit Authority at the Illinois Medical Station Blue Line Stop at Damen, Ogden and Paulina station-houses(all serving one train stop) unveiled by end of August 2018. Crazy 8 Artists’ Carnival showcases the work of eight Chicago artists working in a wide range of mediums and a wild range of techniques. Interpreting the themes of carnival, circus, and festival, the artists are joined by their exuberant delight in the visual and their unique re-imagining of the world. Featuring artists Kass Copeland, Alan Emerson Hicks, Tony Izzo, Anne Leuck, Edward Master, Jason Messinger, Anthony Stagg, and Joey Wozniak. 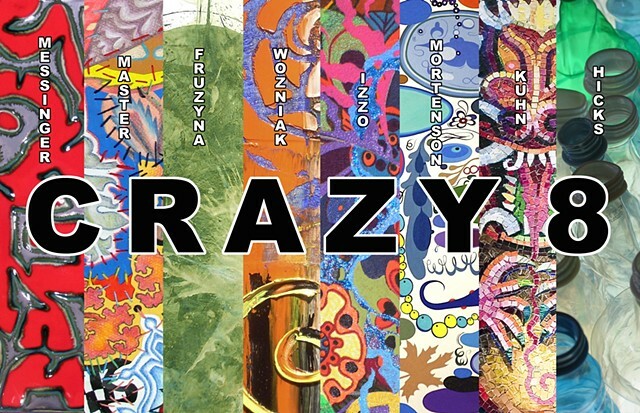 Curated by artist and curator Jason Messinger and Gallery Director and Dean of Arts Shelley Lamantia, the Crazy 8 Artists’ Carnival runs from Sept 26 through Dec 22, 2016, at State Street Gallery, 401 S. State Street, Chicago IL. 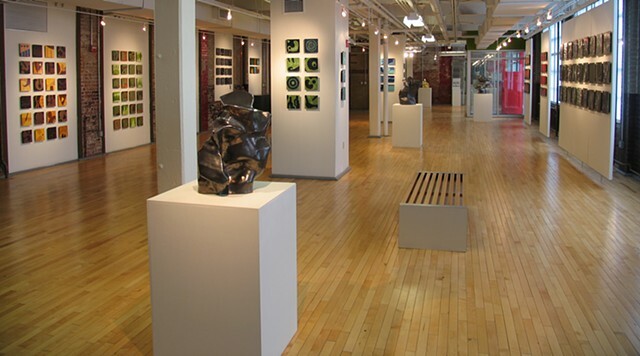 Gallery Hours are Monday through Thursday, from 10am - 6pm. Jazz Cafe: Thu Nov 17, 4-7pm: music by Jazz Cafe and gallery meet + greet with show artists. Additional Holiday Party will be announced. Plan your private studio visit, one-on-one, or groups as large as twenty. Receive special discounting for all sales when purchased directly from the artist in his studio / showroom. Visits to the Design Trade welcome, with or without your clients. Standard pricing discounts to the trade. Featuring work by Jason Messinger and over 60 other Chicago area artists based on the letterform and text. 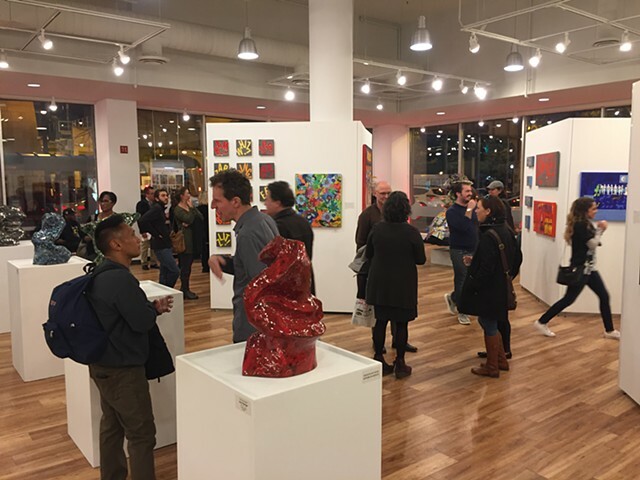 Curated by Nathan Mason of the Chicago Department of Cultural Affairs, the show featured work by seven local artists, and offered a glimpse of their wide ranging practice. "Bigger," is how local artist Jason Messinger describes the work he will be showing, "Bigger and better!" The long time Chicago resident unveils several new ceramic tile murals for the show, including "Spring Madrigal" - a five foot by four foot large mural with his signature letter forms, and the massive nine foot wide by five foot high mural "Sympathies". On view also are "Novas II" and the newly expanded "Sky Rings" - both first seen in the widely acclaimed Crazy 8 show this last November Crazy8Art.com. The show also features the largest presentation to date of the artist's ongoing and popular hand-painted telephone pole series titled "Urban Sentinels". Two earlier murals from the artist's 'Symbology' series are also exhibited. Titled "Keeping Score" and "Gusto", these murals, (last shown publicly in Chicago in 2000 and 2004), explore the artist's interest in symbolic forms. Jason Messinger creates ceramic art that bridges the cool allure of pure abstraction with the hot recognition of representation. He approaches ceramic tile with a painter's concerns and a sculptor's experience. Messinger wants the viewer to bring their own interpretation to his work, creating abstracted symbols that each person interprets with their own unique perspective. His multi-tile works are designed to be modular, allowing any configuration and sequence of the tiles. Mounting systems allow the murals to be easily changed, thus resetting the 'narratives'. 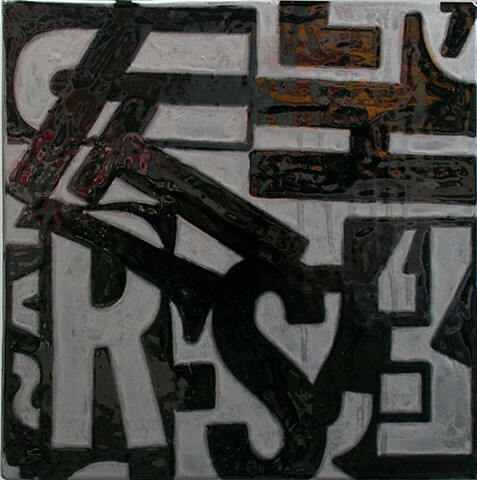 Using a variety of techniques and glazes, the artist makes letters dance in and out of comprehension, re-imagines pragmatically designed utility poles into startling signifiers of organic beauty, carves static clay into kinetic forces, and transforms simple circles into burning suns, exploding stars, and vibrant targets for the mind's imagination. 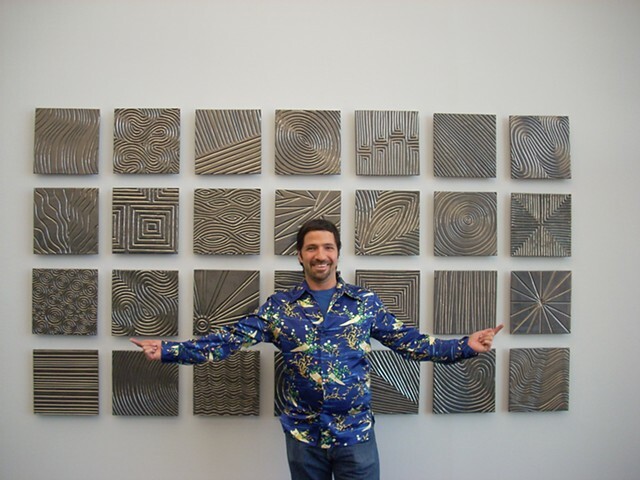 Jason Messinger's artwork has been seen in Chicago and across the country in galleries, museums, and corporate settings. His murals "Alice" and "Letterfied" are part of the City of Chicago's Percent for Art Program Permanent Collection, displayed at the Chicago Public Library's Austin-Irving Park Branch, and are featured in the Chicago Public Art Guide. in a wide range of mediums, and a wild range of techniques.